Available for Bed and Breakfast or Self-Catering accommodation, situated along a quiet country lane, easily accessible from the B2068 (the old Roman Stone Street), in the Kent Downs Area of Outstanding Natural Beauty with lovely nature walks and woodland all around. Great Field Farm comprises forty-five acres (15 hectares) consisting of arable farmland, paddocks and pretty south facing gardens. The arable field has a nature strip around the perimeter where you are welcome to stroll, and where you are quite likely to see wildlife such as deer, hares, pheasants, badgers, foxes, many types of birds and butterflies. Our award-winning breakfasts are always a treat with our home produced seasonal organic fruits, jams and juices, served with a wide choice of cereals and yoghurts, followed by an "Everhot" cooked breakfast normally comprising local sausages, bacon, tomatoes, mushrooms, fried bread and eggs from our own hens, but we are only too happy to accommodate any special requests or diets. As an alternative we also provide generous provisions for DIY continental breakfasts as our eco barns have well equipped kitchens/dining areas. These will typical consist of bread, preserves, butter, milk, juice, fruits, yoghurt, cereals and eggs. This can be a liberating experience for families, or for a relaxed start to a morning, perhaps on their own patio. (There’s usually enough for a late-night snack or elevenses too!). 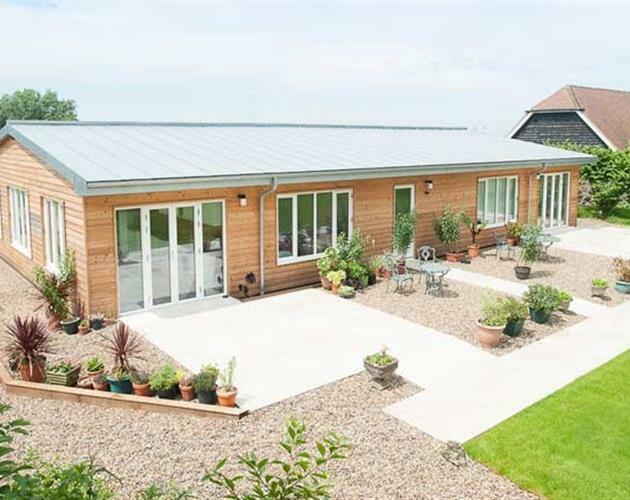 Our Eco Barns have been our “Grand Designs” incorporating many green sustainable features, being powered, as is Sunset Lodge, by our 50kW PV array and a ground source heat pump. We find small guests love the Wendy house and toys we provide.